Photo courtesy of HK Hung. I wiii. They’re pretty old now. @ JonnyTBone: This was unintentionaiiy copycat-ism. It’s not an easy task… especially if slipperly. No! The nursing home wiii. I can donate a Wii to the place, it has a sing along game for them. 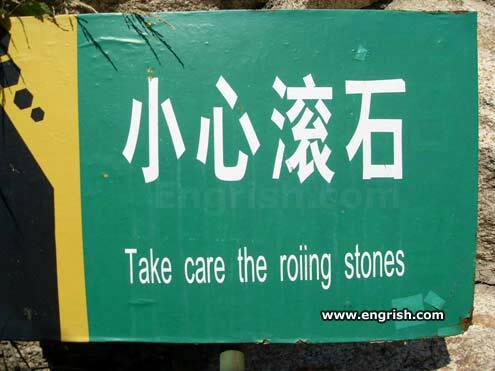 The rolling stones cares a lot about their kidney stones. Located next to Motel Queens where they prepare accidents. Oops, that was a typo. It should have read “rorring stones”. Daddy was a roiing stone. He roiied away one day and never came home. Hey! Why isn’t anybody mentioning me? What am I, a complete unknown? Chopped river maybe? Attention Roiing Rocks . . . Please Don’t Leave Your Roiing Stones Unattended ! Rolling stone gather no morose. Make sure you don’t stand in their way. We don’t want the stones to be hit by you! Yes, look out! They are Super Heavy now! Make sure that they “Miiss You”! Hey Steve, thanks for askin’, man. Now I don’t feel so proud, don’t talk so loud. Guess I’m just gonna have to get used to it. Oh, no! Is that the nystery tramp headin’ my way? Could have sworn I typed mystery tramp. That’s what it’s like bein’ a burn out from the sixties. Iit’s my favouriite musiic magaziine! And miis grows fat on them… Especially after the Altamont Friie Concert. Do you remember it? Biitch (I’m not insulting anyone, it’s one of their songs).